The story is set in 1686’s Amsterdam, Nella, a 18-year-old country girl with good lineage and has just married wealthy merchant Johannes Brandt, two decades her senior, following the death of her father who left his widow with debts and two younger children to take care of. The marriage was arranged, conducted in a simple fashion, without family from Johannes’ side. The groom leaves immediately afterwards on business, leaving the marriage unconsummated. Some time later Nella finally arrives at the Brandt house to find it occupied also by a sharp stern sister, Marin, used to being mistress of the household, involved in and knowledgeable about his business affairs, a maid, Cornelia, and an African man-servant, Otto. Her husband gives her a wedding present of a cabinet, which is in essence a dollhouse. 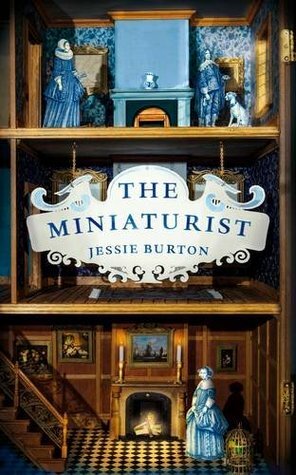 She hires a miniaturist to make pieces for the house that reproduces in miniature every room in the Brandt home. This is Jessie Burton’s first novel and her story maintains the readers interest even though some aspects are immediately obvious before they are exposed, such as the reason for Johannes lack of occupation of the marital bed, but others are perhaps less so, for example, Marin’s story. It is a promising read – it promises an intricate tapestry of life within a wealthy merchant household in old Amsterdam, it promises interesting parallels between the real house and the dollhouse with its miniature inhabitants, it promises a story of Nella’s adaptation to her new life and environment, it promises an exploration of gender, race, class, power within the merchant elite. However, it delivers only partially, so much is not said, so much is not explained, so much is not explored – I wanted to hear more about Cornelia’s history, more detail about Marin’s story (I am trying here not to give anything away as this is the best twist in the tale), more about the developing depth of the conversations between Nella and Johannes, more about the how’s and why’s behind the Miniaturist’s gift of prediction (after all that is the title of the book!). For me, these are skimmed over too quickly. It is potentially a very good story and in the hands of a great script writer and film director will I am absolutely sure make a great film, akin to The Girl with the Pearl Earring, perhaps. Having said all that, it is an enjoyable read. ashramblings verdict 3* an enjoyable read, a promising first novel from a young author with huge potential, and a great film waiting to be made.